Brother SE400 Review: Pros And Cons of Owning One! You Are Here: Home » Top Reviews » Brother SE400 Review: Pros And Cons of Owning One! If you are interested in purchasing a Brother se400 sewing machine, this article is for you. Today, we will share everything you need to know about this model before you buy it. With no doubt, it is a model with a great reputation produced by a trusted brand on the market. Singer 9960 Review: You Should Read This Before You Buy It! 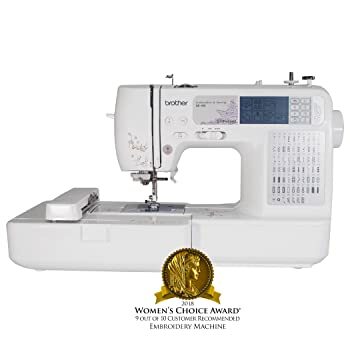 However, just like every other sewing machine, this too has its benefits and disadvantages you might be interested in learning about, especially if you are a beginner without previous experience in buying a sewing machine. For starters, let’s learn something about the brand. Am I Buying From A Trusted Brand? Why Choose This Model? What Should I Pay Attention to When Buying a Brother SE400? How Much Will I Spend on This Model? Yes, if you purchase this model, be sure that you are buying from a trusted, popular brand on the market. The company started in 1908 and developed into one of the most successful sewing companies in the history of sewing machines. They transitioned and developed from the traditional models to modern garment printers and took over the sewing world rapidly. Not only they have one of the best sewing models on the market but also gain respect and popularity all over the world. If you do independent research, you will see that Brother can be found in every continent around the world, except for Antarctica which is impressive. Even though they are one of the most popular brands with a well-deserved reputation, they still offer high-quality products along with affordable prices and incomparable design and appearance. And Brother se400 is one of them. An affordable model with unique features. If you wonder what makes this model so special and why pick Brother se400 among others, we have a few interesting pieces of information that will end your hesitation and make you buy this workhorse today. For starters, it is a good deal for the price that you are paying. Next, it offers impressive features which most of the other models at the same price, do not. It provides a great sewing experience thanks to the different styles of stitches and 165 different formats. Also, it is portable and lightweight and weights about 10.9 pounds. Just like any other sewing machine on the market, this too has benefits and disadvantages. However, what is a disadvantage to some, might be seen as a benefit for others. So, if you are interested in learning more about this model and what it has to offer, keep on reading. One of the biggest disadvantages of Brother se400 is the stitch selection. It requires an infinite scroll, as many customers say. Also, some customers complain about the height of the LCD screen. Others say that the inclusion of the stylus pen is not of big use. And the LCD touchscreen is not colored but black and white, which is also seen as a disadvantage. Brother se400 offers 67 built-in stitches. However, you can only choose 6 items at once. If you want to get the last item, you will have to scroll down a lot. It is the same with the embroidery designs. Last but not least is the fact that you need to clean the bobbin case on a regular basis because of the built-in sensors. Otherwise, it might indicate a problem. Now that you know the negative sides of Brother se400, let’s talk about the positives and benefits that you gain if you buy this model. Although Brother se400 is modern and rich in features, it is still affordable. Also, thanks to modern options like computer connectivity and LCD touchscreen, you can change and import different personal embroidery designs. If you are a beginner in embroidery, do not worry because this model offers 67 built-in stitches. It comes with a visual guide which you can follow in order to learn how to thread the needle. Another good feature is the perfect lighting. It will illuminate your workspace like no other sewing machine and will keep you excited about sewing during the late hours. 67 built-in stitches, including decorative, heirloom, quilting and utility stitches. If you purchase the Brother se400 model, you get a 25-year warranty which is impressive, since other brands offer a limited warranty. It will not only cover the machine but also the light bulbs, needles, and other similar accessories. However, it does not refer to the parts that should be replaced from time to time like a bobbin case, needle plate or some others. Your machine is insured for the next year after the date of purchase. The printed circuit boards are covered for the next five years after the date of purchase, while the chassis unit is guaranteed for 25 years. However, the company will decide if they want to replace or repair your machine. Now, let’s summarize the pros/cons before we jump into conclusion. Just to make sure that you have all the information you need, we will present the pros and cons of Brother se400 sewing and embroidery machine before we share our final thoughts. As you can notice, the benefits overshadow the disadvantages. If you purchase this model, it will make your sewing dreams come true and take your sewing skills to the next level. Do not worry about performance because it is easy to use, especially the bobbin preparation. If you are a beginner, you might not know this, but placing a bobbin represents one of the hardest parts of sewing just like winding a bobbin. It is difficult to loop the thread around a bobbin repeatedly. That is not all. Trying to angle said bobbin into the slot is hard too. Luckily, this model simplifies these tasks with the automatic bobbin threader. It will wind the bobbin with thread for you. And once you do this, just put it into the quick-set drop-in bobbin system and start your embroidering/sewing. It is that simple. Interested in buying? If this did not convince you to purchase this model, the fact that this model will take care of your eyes might. As mentioned before, it has automatic needle threader and impressive lighting, so you do not have to thread the needle and force your eyes to see while doing it. Instead of focusing on the needle and brightness, you can focus on your projects with the Brother se400. Also, computer connectivity is a huge plus, as well as the LCD touchscreen. It allows you to import your personal designs from iBroadery.com into your machine. If you want to explore and experiment with different items, the possibilities are endless. Smooth and quality stitching is also offered by the Brother se400 sewing and embroidery machine. Imagine working on something and keeping everything in order when all the sudden, it slips away and ruins your motivation. If you are a professional, you have probably experienced it before. However, this will all be forgotten once you start working with the Brother se400. It arrives with seven-point feed dogs which allow your fabric to stand still while working. It helps you guide the material under the needle and helps you maintain steadier line work. In general, this model offers simple sewing. No tangling, no jamming. Still, let’s not forget the few negativities. The small hoop size is one of them. If you want to finish larger, more complex projects and designs, you might need to add an additional hoop. Also, you will need to buy other additional accessories such as bobbins, thread, a heat bond, and similar parts. If you want to begin with embroidery, keep in mind that you must buy software and pay for designs as well. If you want something that will satisfy all your requirements, think about buying an all-in-one machine, since the Brother se400 might not be the best option for you. Although it is not perfect and has minor flaws, it is still considered as one of the best, if not the best sewing and embroidery machine on the market at the moment. So, if the flaws do not concern you, do not hesitate to buy this workhorse. It can be found in homeware or craft shops. However, you can also check out Amazon and purchase it online. Expect to pay around $300 for this model. It might be pricey. However, quality comes at a higher price. So, if you want something that will satisfy almost your every sewing and embroidery need, this is the perfect choice for you. We suggest that you buy it before it goes out of stock. Also, do not rely on our words and this review only. Make your own independent research and decide whether this is your jam or not. If yes, we cannot wait to hear your comments and read your personal review. Feel free to check the current price on Amazon right now. If you decided to buy this model, we congratulate you. It is definitely worth the price and will serve you for a very long time. It is one of the best combo computerized embroidery and sewing machine. However, if you want it to function perfectly, we suggest proper care and maintenance on a regular interval. It is suitable for both beginners and professionals. However, keep in mind that you are dealing with an advanced combination machine and you might face some difficulties with the controls since there is a lot of them. Overall, it is a great pick for the price you pay. It is ideal for experimenting with embroidery and sewing. Still, keep in mind that you will have to purchase some extra accessories, as we mentioned. Besides that, you are making a great deal if you decide to invite this highly-recommended sewing machine to your home or work space. It will definitely boost your creativity and get your creative juices flowing. One of the best combo machines on the market for a reason. Feel free to share this article with the people you love, in case someone is looking for their next sewing machine. Do not forget to follow our social media pages for the latest reviews. The 10 Best Sewing Machine For Quilting Picks That Will Blow Your Mind!